A pair of ranked teams will meet in the first round of the Class 2-1A playoffs when the Lyndon Tigers travel to face the St. Mary’s-Colgan Panthers on Friday night at Pittsburg State University’s Carnie Smith Stadium. Lyndon dropped its first game of the season last week, falling 41-33 in five overtimes to Olpe. Jaden Hielscher’s 15-yard touchdown run gave Lyndon a 20-12 lead with 3:23 left in the fourth quarter. But Olpe scored a touchdown and the two-point conversion to push the game in overtime. Then the two district opponents matched each other through four overtimes. In the fifth, Olpe scored on a TD pass and a two-point conversion before Lyndon’s fourth-down pass was knocked down in the end zone to end the game. The Tigers have lost to Olpe in each of the past four seasons. Last year, Lyndon rebounded from its loss to Olpe and advanced to the second round of the playoffs. Lyndon is led by senior Dexton Swinehart, a versatile playmaker with about 1,300 yards rushing and about 700 yards receiving. He has 37 touchdowns as a rusher and receiver, and he has another as a passer. Swinehart has also posted 52 tackles and a team-leading four interceptions. Senior quarterback Jamie Reed has passed for 1,274 yards and 21 touchdowns with only four interceptions. Colgan enters the playoffs on a five-game winning streak. The Panthers won their three district games by a combined score of 162-14. Senior running back Max Wilson leads the Panthers with about 800 yards rushing and nine touchdowns. Junior quarterback Cade Simmons passed for about 400 yards and rushed for more than 500 while filling in for injured starter Bryce Hutchins. Colgan’s only two losses were to Class 3A’s fifth-ranked Galena and Columbus, which was ranked No. 1 in Class 4A Division II at the time. Galena and Columbus both advanced to the playoffs in their respective classifications. This will be the first meeting for the two teams since 2011 when Colgan beat Lyndon 38-13 during districts. Give the Panthers the advantage as they play a more difficult regular-season schedule, battling 4A Division II and 3A schools in the Crawford-Neosho-Cherokee League. The first round of the playoffs is full of regular season rematches, including La Crosse at Elkhart. In Week 1, Elkhart defeated La Crosse on the road, 30-20, in a game shortened by weather. Elkhart lost in Week 3 at Lakin, 34-18, and in Week 6 at Cimarron, 30-6. The Wildcats defeated rival Meade, 18-15, in Week 8 to secure the district. Elkhart has a total margin of 350-138. Junior quarterback Lane Whisennand has enjoyed a breakout year. He has 178 carries for 1,762 yards and 26 of the team’s 38 rushing TDs. Senior Joshua Salazar has 100 carries for 659 yards and eight scores. Passing-wise, Whisennand has completed 45 of 73 passes for 905 yards with a 10/2 TD/INT ratio. Elkhart has averaged 8.2 yards per rush and 12.7 yards per pass with just five total turnovers. Elkhart is plus-11 in turnover margin. Salazar leads the defense with 79 tackles, while sophomore Chace O’Hair has a team-best 7 TFLs. Last year, Elkhart went 6-4, finished second to Meade in the district and then lost to Plainville, 49-6, in the first round of the playoffs. Elkhart opened last year with an 18-12 win against La Crosse. Whisennand had just three carries and six receptions in a reserve role behind quarterback Tyler Sklenar, who signed with Kansas Wesleyan. In ’16, Elkhart had nine turnovers and was plus-12 in TO margin. However, the offense averaged just 5.4 yards per rush and 7.1 yards per pass. Elkhart is 0-3 in the first round of the playoffs since a 6-5 season in 2009. That year, the Wildcats defeated La Crosse, 60-26, at home in coach Jon Webster’s first season as Leopards’ head coach. That marks just one of three playoff wins in school history with the other two coming in a ’93 semifinal run when the Wildcats won overtime games against Cimarron and Smith Center. Elkhart is 3-0 overall against La Crosse in the last eight years. Elkhart has had some really nice skill players in the last decade, especially with quarterback Alex Gomez and fullback Tanner Burnett. The Wildcats have used both a blur spread offense and heavy ground game. However, Whisennand has led the offense to its most efficient season in the last decade with high-water marks in yards per carry and passing efficiency. The Wildcats have 33 players and 10 seniors, seven at least 200 pounds, led by its senior trio of Tomas Mendoza (5-8, 310), Brian Chavira (5-10, 260) and Brady McCabe (5-10, 235). La Crosse has 26 players and just six seniors. Their two biggest players are both freshmen with Parker Cheatham (5-10, 255) and Mason Peters (5-9, 240). Seniors Kadin Trower (6-2, 222) and Jacob Showalter (5-10, 220) are veterans up front. Sophomore Hunter Morgan has played efficiently in his first year as quarterback with 53 of 91 for 908 yards with a 10/4 TD/INT ratio. Senior Zac Brown has 100 carries for 612 yards and 11 TDs. Senior Brett Herrman has 33 catches for 590 yards and six scores. La Crosse has seven turnovers and is plus-9 in TO margin. The Leopards have averaged 5.5 yards per carry and 9.8 yards per pass. 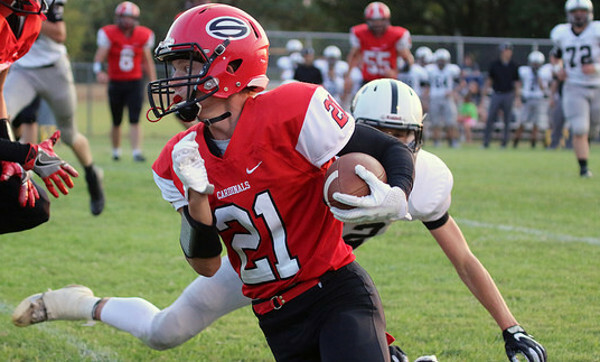 Outside of Elkhart, La Crosse fell to Colby and Plainville by 49-7 and 49-6 margins. Last year, La Crosse won at Meade, 44-29, in a first-round upset in a 5-6 year. The Leopards had all but six of its offensive yards come from veteran seniors. The top-four tacklers were seniors. This year, La Crosse could again pull the upset but is younger than ’16, especially at the skill positions. But Whisennand had a breakout performance with 163 passing, 255 rushing and four scores in the win. Elkhart has home field advantage, a more veteran-laden team and one of the state’s most electrifying players.